I’d pushed my luck going out for a run at 8.30pm but, the evening was warm and comfortable and it was nice getting into my running gear knowing that I wouldn’t have to prepare for rain. Also, I was back in Dorset where I’d grown up and I could head out knowing that I could just enjoy a run in familiar territory but with new footpaths just waiting to be discovered. I’d also coerced the Grandparents into babysitting duties I knew that I could head out in any direction and just run as far or fast as I wanted without worrying about mounting childcare costs or a call from a panicked babysitter saying the 4 year old has locked her in the toilet and is going though her handbag eating her makeup. 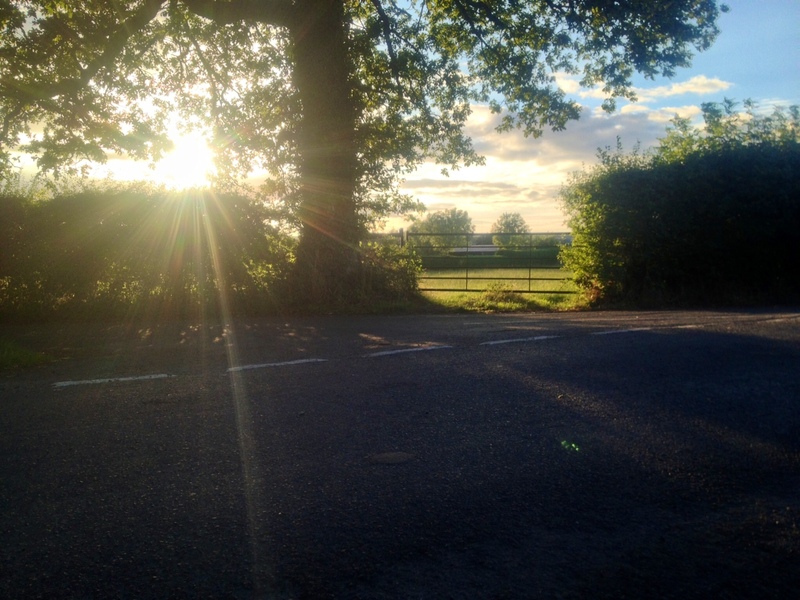 The lanes were peaceful and sleepy in the balmy evening air and apart from the occasional rabbit bouncing across the road in front of me to jump into the hedge (even the rabbits were relaxed tonight) and the grasshoppers chirruping in the fields, I was alone. It was perfect. I hadn’t decided where I was going to run - only the direction - so I could explore and choose the paths that looked the most appealing. I ran up the long slow hill overlooking Oborne and looked over the gate at the drowsy village in the valley below. Rabbits watched me from the slopes, their ears pricked up to see if I was any danger. At the crossroads ... time to make a decision. I started up the steepest and most broken of the crossroad arms. A road in theory but only a tractor would be able to traverse this broken road. Filled with potholes and loose gravel and chunks of broken stone, it was much more fun to run on than the lanes and despite the hill I’d made the right choice. The banks were high with grass and the overgrown hedges were heavy with flowers. It was a pretty route and the evening was loud with the buzz of grasshoppers. Up to the brow of the hill and another crossroads. Left was a rutted mud lane to Poyntinton with an eerie track covered entirely by trees covered entirely by trees like a small, dark green tunnel. That way could be fun with company but it was spooky to run on your own. During the civil war, opposing armies had faced each other from the hilltops and met in the valley with a clash. It wasn’t the right path for a gentle evening run. Ahead was a farm track with dilapidated farm equipment on either side of the path, raising rusted arms to make shadows against the evening sky. I turned right turn and ran down the muddy stony hill into Milborne Wick. Faster and faster down the lane, past the cows, calves and barking dogs of the farms. I passed the duck pond, muddied edges and feathers floating on the surface. As I came into the village, I spotted something white by the side of the road. Egg shell. I picked it up and it lay white and fragile like the most delicate china on my hand. Running on into the centre of the village and to the crossroad and another choice. My decision hurried by the barking of a dog, I chose the fork in front of me and ran on past the still waterwheel and under the overhanging trees making the light dim and the lane gloomy. I could hear the ducks in the pond on my left although I couldn’t see them and as I passed, a drake laughing. As I ran up the road, my quiet progress frightened three birds from a barn rooftop. The light was too dim and I couldn’t identify them. They were dusty brown and although they hunched like hawks their wingspan was small. One landed on a telegraph pole and turned its head to look at me. Ah. A young owl then. I ran past a gateway and as I passed the cows jumped back in surprise making me jump. I stopped and went back. Usually cows gather round. They look at you with their big brown eyes and wonder if you’re a new type of moving, walking, noisy grass. 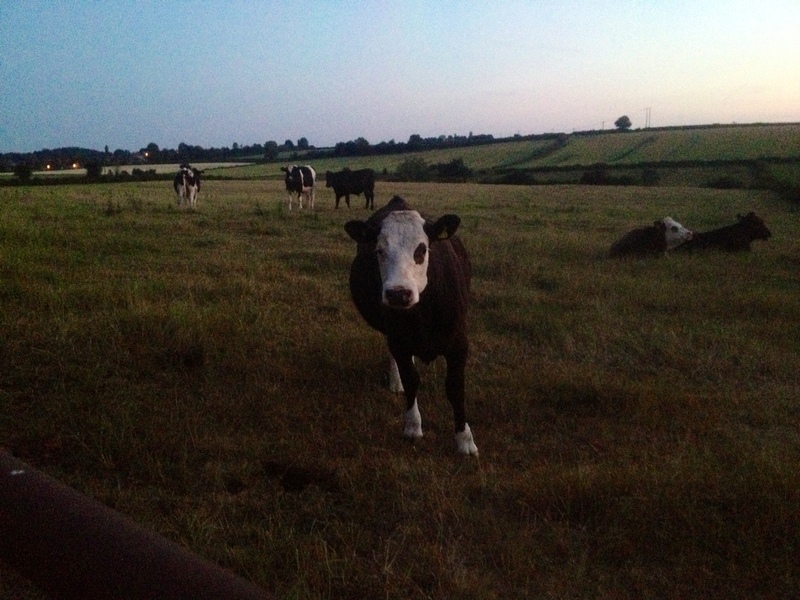 However these cows were more wary and looked at me from a distance. By this point it was almost dark and I’d turned into a moving food chain. I was running along, being followed by a cloud of gnats and the bats were following the gnats. All 3 species moved along slowly enjoying the evening. Enjoying, apart from the being eaten part, obviously. The light was really going now so I headed back for home. 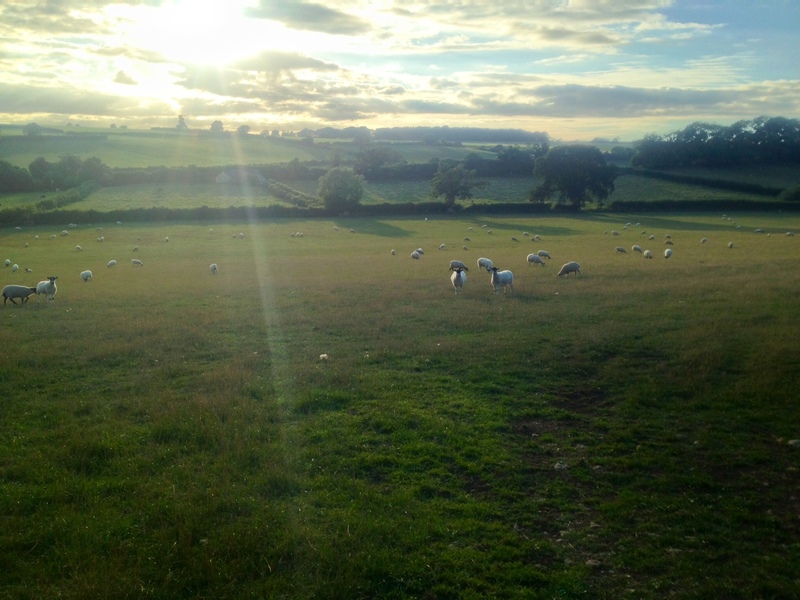 I turned onto the grassy footpath and had a brief chat with a couple of dog walkers - who I noticed didn’t have a travelling midge / bat cloud – and ran on through the fields. This bit can be a bit dicey as you have to multitask to avoid the cow pats, stop yourself falling down the steep hill or tripping down any of the holes. It’s more difficult than it sounds and several times on the way back from the pub there have been cider-assisted falls ended in a splat. However, I managed to avoid any trips, splats and holes and was barrelling down the side of the hills, the stones rolling under my feet as I tried to stop myself finishing the descent on my arse. As I got to the bottom of the hill I noticed that in the field gateway – tucked away in on a quiet lane – was a car with the interior lights on. Oh how sweet, I thought. My parents have come to pick me up worried about me running through the dark lanes. Then as I got a bit closer, I noticed that the interior light was illuminating bare skin. Now I REALLY hope it’s NOT my parents. Oh dear, it must be a couple out for some private time. They probably drove through the quiet single-track lanes and found a convenient gateway tucked away off of the road and decided to have some fun without thinking that a runner – with a delicate mind and no wish to see some rural (and no doubt first cousins – this is the country) yokels - indulging in hide the sausage. Eek! The gateway was my only way out of the field apart from the way I’d come. How was I going to sneak past the car without getting an eyeful of something unwanted and X-rated? Voyeurism has never been particularly high up my list especially not in the country where there’s a high chance of a shotgun in the car and getting chased through the fields while having my arse peppered with shot for seeing something I really didn’t want to isn’t really how I pictured my quiet Saturday night run finishing. I was just imagining the Deliverance banjo music when I noticed that it was just 2 lads, with shirts open on a warm night, sitting in a Corsa drinking cider and having a smoke. Phew! I like going out for a run in the twilight but I definitely didn’t want to get shot, didn’t want an eyeful of heaving flesh or having to play a banjo with a toothless wonder. I thought that this was by far the best ending. Besides, much as a shotgun-assisted sprint finish would improve my run stats tonight, I prefer a gentle run and no yokel chase. I ran up to the winding crest of the hill and down the other side thankful that I knew the lanes so well. All the sky was dark now and all of the hedges just black against the night sky. There was the occasional rustle in the hedge as a bird or a rabbit was startled as I passed, but as I went past some abandoned farm buildings, the hedges were shaking as though something was trapped. I clapped my hands and made a loud noise – I didn’t want to startle a fox or badger which might bite if it thought I’d cornered it. I ran past the place where the noise was coming from and turned around, just in time to see a black thing barrelling out of the hedge and running up the road. No idea what it was but it looked too big to be a fox and was running too smoothly to be a badger. I made it home with my final mile being the quickest yet. I love your posts chick you always have the most entertaining runs it makes me want to run with you as mine are always so uneventful! Well ... as you'll be doing the Thames Trot with me, you may get to witness some run excitment first hand. If I go screaming past trailed by attacking swans or something, please try and rescue me. I don't invite run excitement ... it just kind of happens to me! !